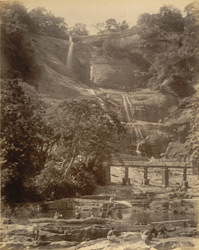 Photograph taken about 1900 by the Government photographer, Zacharias D'Cruz of a view of the water falls at Courtallam, part of the Curzon Collection. George Nathaniel Curzon was Under Secretary of State at the Foreign Office between 1895-98 and Viceroy of India between 1898-1905. It is one of 76 prints in an album entitled 'Album of South Indian Views'. This waterfall is situated in a very picturesque scenery in the Western Ghats and is said to have medicinal properties. The main cascade is formed by a three-stage drop 91 metres high. The site takes it names from the Kuttalanatha temple, a Shiva temple which attracts many pilgrims.